Thinking in Java rocks the free world! Miko O\u2019Sullivan, President, Idocs Inc. 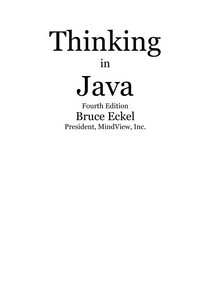 Thinking in Java / Bruce Eckel.\u20144th ed. Copyright © 2006 by Bruce Eckel, President, MindView, Inc.